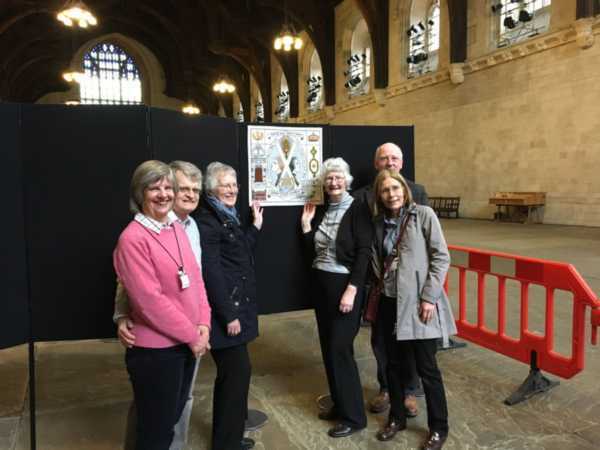 Embroiderers and Scots from the London region are making their way, through the tight security at Cromwell Green Entrance to Westminster Hall, to see the tapestry exhibited there. It has to be admitted that the sheer size and openness of the Hall for once make the 305 panel tapestry look small! The Crown Court Church team led by Sheila Haddon from Covent Garden, which is hosting this particular exhibition, is pictured below proudly standing in front of their 'own' embroidered panel. Despite the hiatus for the exhibition following the tragic incidents at Westminster on March 22nd, the embroidery teams from Gothenburg in Sweden led by Jorgen Linden former Lord Mayor, and from Veere in The Netherlands led by Hanneke de Vroe, were able to visit the tapestry. Gothenburg were the first team to complete their panels and Veere the first to present the full 305 panel exhibition. 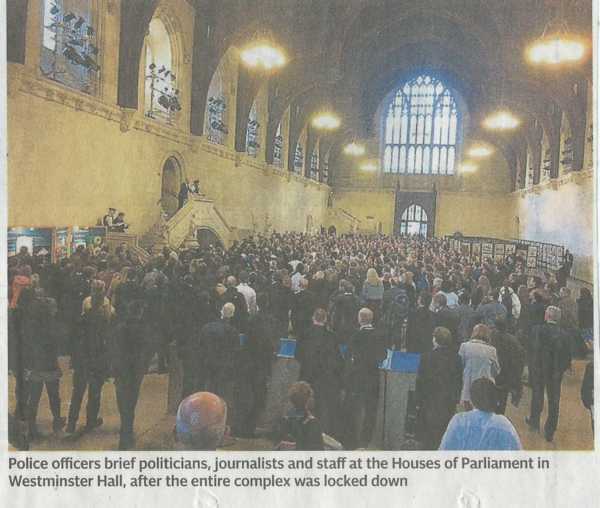 During the lock down of the Palace of Westminster following the tragic incident, MPs and staff were kept for 4 hours in Westminster Hall giving many the unexpected opportunity to see the tapestry there. 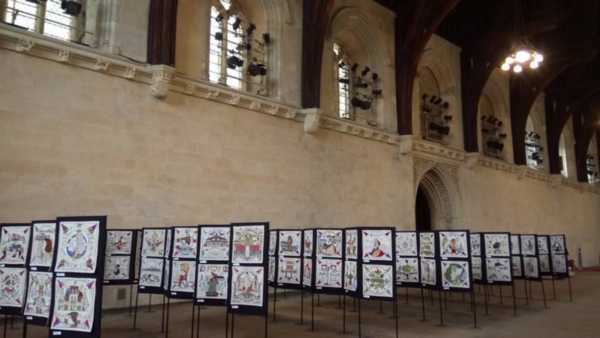 After the Easter Recess for the UK Parliament, an Invitation to all MPs and Peers is planned as the campaign begins in earnest to create a permanent home for the tapestry alongside the original Battle of Prestonpans 1745 Tapestry in Prestonpans itself. That latter artwork is expected to be displayed not only in Brittany at the Festival Interceltique [FIL] in Lorient in August 2017 but also in the Scottish Parliament at Holyrood. Stitchers: Sheila Haddon, Janet Dowswell, Christine Ward, Elizabeth Chestnut, Jennifer Laird, Sheena Tait, Elizabeth Steel, Linda Mjcher, Alison Dartnell . In days gone by, before the Union of the Crowns in 1603, Scotland maintained an embassy in London roughly where Northumberland Avenue is now. There was a small church there, used by visitors and embassy staff, which maintained the Scottish style of worship. When King James VI of Scotland ascended the English throne in 1603 the embassy, now redundant, was closed, but the church was greatly enlarged due to the influx of Scottish courtiers accompanying the king. The congregation continued to worship on the old embassy site until, towards the end of the seventeenth century, a disastrous fire, which destroyed everything around Northumberland Avenue, caused them to become peripatetic for a time. Records show that they were meeting in Upper St. Martin’s Lane in 1711 and, by now known as the Kirk of the Crown of Scotland, settled on the present Crown Court site, just off Drury Lane, in 1718. There they built a new church which opened the following year. Thus matters continued for another century and a half or more, until, come the latter part of the nineteenth century, the church building had become dilapidated and indeed the whole Drury Lane area had become very run down. In 1881 a new minister was called on the tacit understanding that a new church would be built in a more salubrious and convenient part of the town. This was duly done, and St. Columba’s, Pont Street, Chelsea, was the result, whither the congregation moved, lock, stock and barrel in 1884. Except that, congregations then being not terribly dissimilar to congregations now, not everybody went. Some remained, and eventually, thanks to the energy and dedication – not to mention the generosity – of many people, particularly the daughters of the 8th Duke of Argyll, Lady Frances Balfour and Lady Victoria Campbell, the present building was erected in 1909. It is worth remembering that when the original church was built in 1719 it was not long after the Jacobite rebellion of 1715, and indeed there was another, albeit a lesser, uprising in 1718. 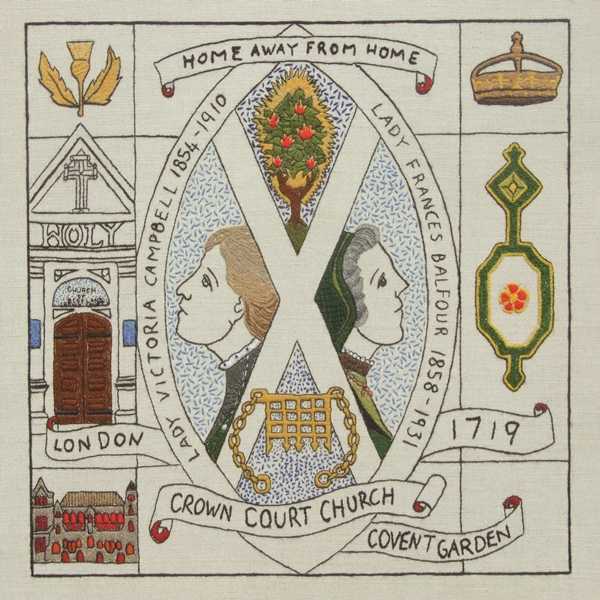 As a Scot in London at that time, it would therefore have been important to show which side you were on, hence the emphasis in the church on their links to what was now the Hanoverian succession, with its Scottish roots stemming directly from King James VI and I. When the church was rebuilt in 1909, the Campbells were very much involved, and as the Campbells were never noted for their Jacobite sympathies – quite the reverse, in fact – the Hanoverian associations were not forgotten, with the result that we now have the magnificent Royal Coat of Arms on the back wall of the church. The present congregation, mainly Scottish or of Scottish extraction, but with a good number of Presbyterians from elsewhere, is lively and friendly, with an active Rambling and Social Club, Sunday School, choir and Guild – one of the oldest branches in the Kirk. It is a little bit of Scotland, found in Covent Garden, the heart of central London. Ro 1603 bha eaglais bheag aig ambasaid na h-Alba ann an Lunnainn, air a dèanamh nas motha às dèidh Aonadh nan Crùn do luchd-cùirte Albannach. Chaidh a sgrios le teine ach thuinich an coitheanal taistealch air làrach Cùirt a’ Chrùin dheth Leàna Drury ann an 1718. Dh’fhosgail eaglais ùr a’ bhliadhna às dèidh sin, ach ro dheireadh an 19mh linn bha i air a dhol bhuaithe. Ann an 1884 chaidh eaglais ùr (Eaglais Naomh Chaluim Chille ann an Chelsea) a thogail, ach cha robh an coitheanal uile airson gluasad agus chaidh togalach ùr a thogail ann an 1909 dhaibhsan a dh’fhuirich. San latha an-diugh tha e mar phàirt bheag de dh’Alba a tha ri fhaotainn ann an teis-meadhain Lunnainn.